Its not always easy to know what to do when a friend who is going through some mental health issues confides in you. On the other side it can be very difficult to reach out for help when you need it most. We wanted to bridge this social gap; making it easier for both sides to connect with each other. 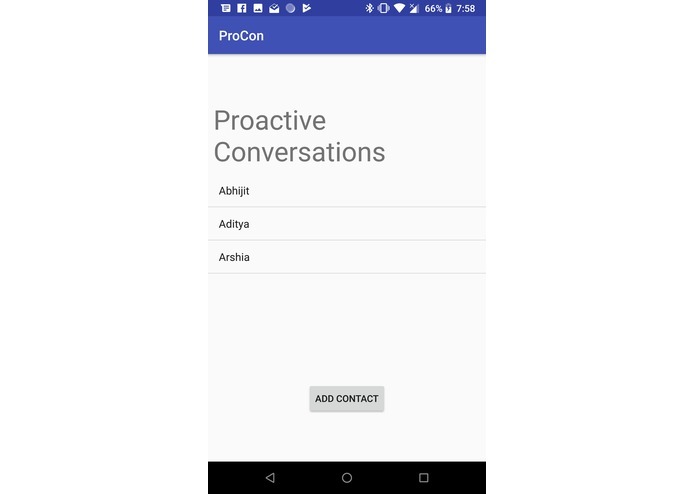 ProCon helps users to set up trusted contacts to reach out to when they're going through some mental health challenges and might need to reach out. We monitor outgoing texts from the user and perform sentiment analysis using the IBM Watson Tone Analysis API, and combined with a few heuristics we estimate the mental state of the user, and automatically reach out to the people they trust when we think they might need to. For the person receiving this notification it's not always obvious how to respond, so our app prepares a few guidelines and talking points, based on the estimated mental state, to help them navigate the interaction and help them help their friend. These guidelines include topics to avoid, and how to get professional help. The app is built entirely using native Android, and the IBM Watson Tone Analysis API. Ideally we would have trained a model more directed towards our use case, instead we apply some heuristics to figure out the emotional information we're interested in. We run a background service periodically to analyze the emotional state of the user from their recent text messages. Our team was a mix of very rusty at, or completely new to native Android. We ran into a lot problems getting our native back end to function reliably, including some fun Android API 23 bugs for WorkManager (which we used for background tasks). We could expand on the quality and type of information that we offer to users of the app; for example giving them recommendations for services tailored to the location of the person they're trying to help, and getting real professional advice into the app, instead of our placeholder research. We could improve our emotional state estimation by training models on Watson tailored to our use case, and use some more sophisticated heuristics, and other sources of data besides text. We'd also like to be able to help people with substance abuse problems that are trying to get clean by trying to predict if they're heading towards a relapse. I implemented the functionality that allowed the app to read the user's last few text messages. This runs in the background and executes every 15 minutes. This tied into Devin's IBM Watson implementation and using the data from Watson, we sent a text to the trusted contacts in our database.